“Oogy”an affectionate derivative of “ugly”, is a heartwarming tail for dog lovers, or for those who simply enjoy pulling for the underdog. I’m a sucker for dog stories, especially those with a happy ending, which I’m relieved to report is the case for Oogy despite his rocky beginning. 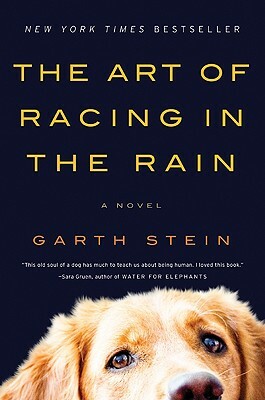 I’m always anxious to know before getting emotionally involved & spending hours in a book if the animals or dogs fare well. 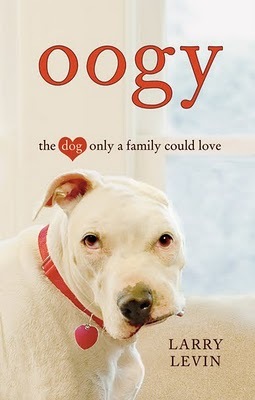 “Oogy” is the true story of a puppy who was used as “bait” for fighting dogs when he was just a few weeks old, and was so badly mauled and disfigured that he was nearly put down when he was discovered abandoned during a police raid in Philidelphia. But the staff at the Ardmore Animal Hospital, which sees this kind of thing all too often, immediately noticed something special about the white dog whose left ear had been torn off, his jaw smashed, the side of his head torn open. Despite everything that had happened to him, he showed absolutely no malice to other dogs or hospital employees. Instead, he eagerly dispensed licks and wag, offering thanks to his rescuers in the only way he knew how. Against all odds — or common sense, it would seem — the animal hospital spent hours operating on the dog and fostering him through his recovery. When they were certain he did not pose a threat, the one-eared pup with the lopsided face was given a second chance, and adopted out to the Levin family. The author, an attorney who, along with his attorney wife, were on the treadmill of attorney life when they received a call that would forever change their lives: It was the “stork,” delivering the news that they had been approved to adopt two newborn boys, twins they would later name Dan and Noah. The twins bring indescribable joy and upheaval, a cycle that would be repeated years later with the arrival of a four-legged troublemaker. Whether it’s by chance or fate, Levin and his sons arrive at Ardmore Animal Hospital one morning in 2002 for a grim task: Their elderly cat must be put to sleep. Once there, they cross paths with the one-eared dog who immediately greets them like they’re his long-lost family. You know what happens next. They name him Oogy. Oogy is a handful from the get-go — he’s often found sleeping atop the dining room table, and a bungee cord must be used to secure the refrigerator. (Yes, the dog figures out how to open the refrigerator and fetch food for himself.) Oogy spends his mornings keeping the boys & dad company during their routines of getting ready for school & making breakfast. He eats his kibble while the twins enjoy their breakfast of pancakes. 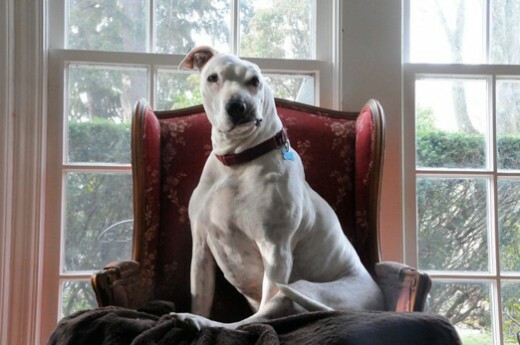 . .
At first, Oogy is believed to be a pit bull, given they found him during a raid and was obviously used as bait. Later, he’s discovered to be a Dogo, a rare breed known both for its ferocity as well as its gentle devotion to his family, and especially tolerant of children. Levin believes Oogy’s love for the dining room table (which at times Levin would come home to Oogy LAYING ON IT! HAHA) stems from his desire to position himself high so that he can better watch and guard over his family. Oogy’s triumph, not so much the lap-of-luxury life that he now enjoys, but his ability to overcome cruelty, has led Levin to begin training Oogy to become a therapy dog, particularly for those who are wounded and disfigured. “I believe that Oogy will be able to help those in need to understand that scarring, disfigurement, and trauma, whether physical or emotional, do not have to define who they are…. That no matter what has been inflicted upon them, love and dignity are attainable,” Levin writes. The sad and ugly truth and facts of dog fighting and ‘bait’ for those fights, any animal and often cats, that can be found through ‘free to good home’ ads, strays, kidnapping, etc. is simply too horrific & hard for me to wrap my brain around. I think you’ll find, “the dog only a family could love” is one that you will love too. The monster showed up just after midnight. As they do. But it isn’t the monster Conor’s been expecting. He’s been expecting the one from his nightmare, the one he’s had nearly every night since his mother started her treatments, the one with the darkness and the wind and the screaming… The monster in his back garden, though, this monster is something different. Having only two novels published (A Swift Pure Cry in 2006 and The London Eye Mystery in 2007), Siobhan Dowd had already received many awards for them and was seen as one of the most promising authors for young adults. After she died in 2007 (of breast cancer), two other novels that were already completed before her death were published (Bog Child in 2008 and Solace of the Road in 2009). But before passing away, Dowd was working on a book about a yew tree with special powers and a boy dealing with his mother’s terrible illness. It was to remain unfinished and unpublished but her editor talked to Patrick Ness about him finishing it. At first, he thought it was not a good idea: to finish the work and to be the voice of another author, especially one as accomplished and beloved as Siobhan Dowd, just did not seem right to him. Then what he did was to use her premisse and her characters to tell his OWN story, in his own way and voice, but a story that he thought Dowd would have liked! That’s how this book was born. The book is powerful, moving and really feels sincere (which is very important in a story about telling the truth). 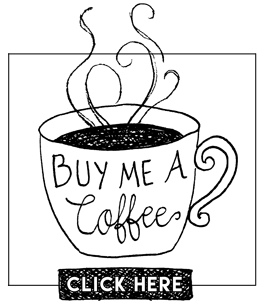 Even if it is labeled as “young adult literature”, its subject matter is not light at all. The mother’s illness is never named but it is not hard to conclude what it is. 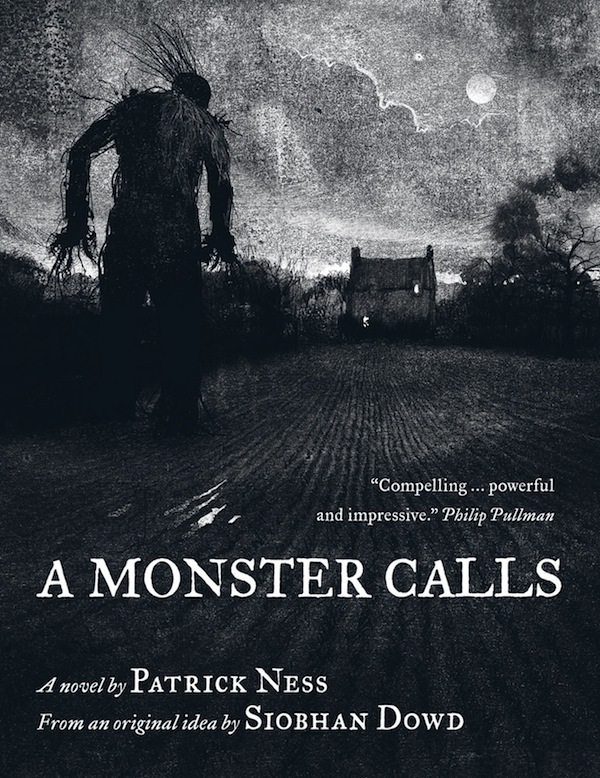 The novel is a horror story but, just as the monster that appears for the boy, it is not what you would have expected. 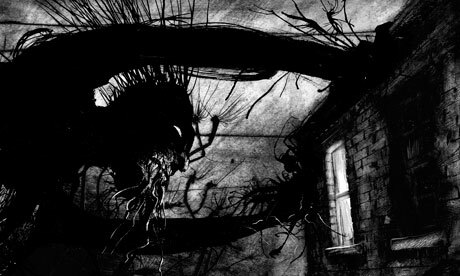 The horror comes not from the monster but from the real world issues that the boy has to deal with: his mother’s illness is the real monster of the story. It’s the illness that threatens all the characters in different but equally powerful ways. It’s the fear of what it can do and all its consequences. There are a few cliches: the boy is an outcast, he is constantly bullied at school, there’s a female friend who is “almost like a sister” and even an “evil” grandmother. But after a while you find out that they are all much more complex than you thought at first. The monster itself is intriguing and you really don’t know what to expect from him. Which is very fitting for what is basically a wild force of Nature. What is it? Where does it come from? And why? Oh! The book is illustrated by Jim Kay and his work is a perfect match for the material. He uses a lot of silhouettes, shadows and negative space. The dry brush strokes, drippings, splashings and textures show all the anger, pain and energy that the story portrays. It really is a beautiful book in all aspects. It will make you think about your own life, it will make you worry about inevitable circumstances, it will make you angry about how unfair many things are but, most importantly, it will remind you of what really matter in life: love and the truth. More specifically: telling the important people in your life that you love them and being true to yourself! This story is about a boy named Jacob, a loner and a bit of a misfit son of well-to-do parents whose grandfather seems to have a very wild imagination and dies a sudden and horrific death. Jacob likes adventures and he’s always listening to dear old gramp’s stories about the strange home he escaped to evading the Nazis. The home was filled with peculiar kids with varying talents. From girls who can make fire, to people with mouths on the backs of their heads. The stories are all supported by these bizarre pictures that his grandpa has kept all these years depicting the things he told his stories about. When Jacob gets older, he realizes these stories can’t possibly be true– that the monsters were just the Nazis; that the home’s fantastic children was a way of coping. Then, Jacob witnesses his grandpa’s death at the hands of one of the monsters from the tales and suddenly, anything is possible. 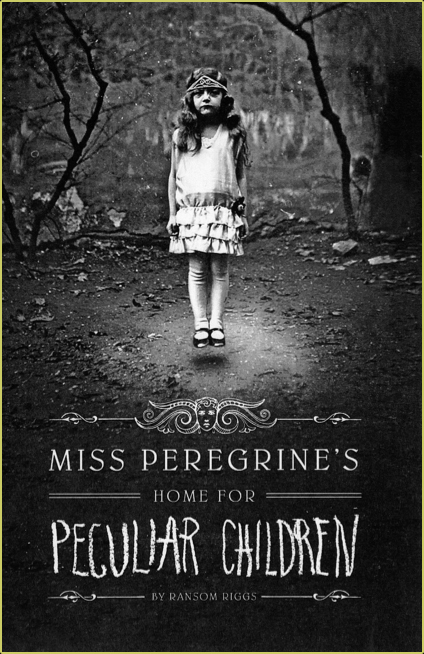 He writes it off as crazy at first, but eventually, with the support of his oddball shrink, he convinces his parents he needs to go to Wales for a break following the death of his beloved grandfather and embarks on a journey to Miss Peregrine’s home, where he discovers the truth. The writing in this story was amazing. Rigg’s was wonderfully unafraid of using big words, and in doing so, Jacob had a mature voice that really stood out among the more blunt first-person narrators we see these days. I really enjoyed Jacob’s character! He was adventurous, but very pragmatic. He definitely thought before he acted. And he was smart, but it was shown by his decisions, not because he mentioned he had 7 AP classes. Hmmmm? Another awesome feature was the concept. The plot. The story itself. It was mysterious, deliciously creepy, and so unique that I think there was nothing I could’ve guessed at. The lore in the story was clearly well thought out and the book explained it perfectly. No confusion, no plot holes. I found it well paced and the events that took place realistic. Jacob gets caught up in this adventure, but his dad is also there and while Jacob is piecing together clues, his family becomes more fleshed out and you start to see why the choices Jacob makes at the end of the story are easy. It’s all very linear and it makes a lot of sense. While this book’s ending is certainly satisfying, it’s not a hard leap to see where future novels would take us because there is still a villain at large and there is enough content and background to supplement further investigation into this world. Putting aside everything I’ve said, I think what really makes this book good are the pictures that dot the chapters. Like the one on the cover, they are a perfect blend of freaky and enticing. It makes everything seem so much more real and alive because, well in a sense evidence is staring you right in the face. I think it was a fantastic touch and really innovative. This is a book I would definitely recommend! Now, if you haven’t notist these days, alot of books are being made into movies. I have been hearing rumors that good ol’ Tim Burton is in talks to develop the book as a potential directing project, and he would be involved in setting a writer to adapt the tale. “ALEX KAVA GREW UP IN THE COUNTRY outside Silver Creek, Nebraska. She earned a bachelor’s degree in art and English from College of Saint Mary in Omaha, Nebraska. She has done a variety of jobs, from working as a hospital tech, cleaning and sterilizing utensils from surgery, pathology and the morgue, to running her own graphic design firm, designing national food labels and directing television and radio commercials. IN 1996 SHE QUIT HER JOB as a public relations director to dedicate herself to writing a novel and getting published. To pay the bills, she refinanced her home, maxed out her credit cards and even took on a newspaper delivery route. ONE FALSE MOVE WAS SELECTED AS Nebraska’s 2006 One Book One Nebraska. (My Antonia by Willa Cather was the 2005 selection). In 2007 Alex was awarded the Mari Sandoz Award by the Nebraska Library Association. Whitewash made January Magazine’s list of best thrillers for 2007. Exposed,Black Friday and 2011’s DAMAGED received starred reviews by Publishers Weekly. 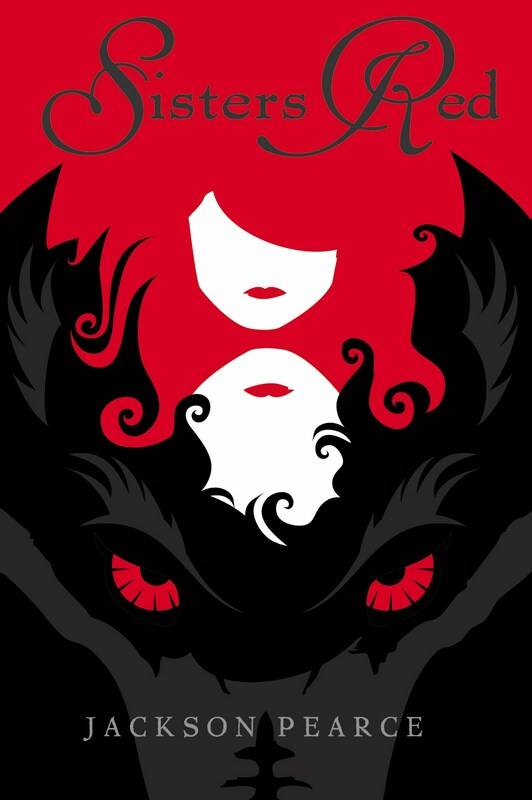 I’m sure most of you have heard of this author because of her ever so popular Twilight Series. The Twilight series was directed more toward the Young Adult crowd (even though every age seemed to enjoy them 🙂 ). The Host was written more for the Adult crowd, so you won’t find it sitting next to her Twilight books! I’m going to be honest with you, I’m not really one to read books about “aliens”. I will read Science Fiction books, but the whole “alien” thing doesn’t pull me into a book. This is a pretty large book. When I started reading it, I was lost right off the bat…I wasn’t sure what the heck was going on and I concidered just not reading it, but I knew who the author was and told myself to just keep going and I was sure it was bound to get better. I WAS SO GLAD I DID! This book is about “aliens” but that word means so many different things. You might think of them as creepy things from outer space, or cute little green men. Also, some people have a fear of INVASION! Yes, in this book, the world does get invaded. Now, don’t loose intrest yet. The world gets invaded with planet-hopping parasites that insert their silvery centipede selves into human brains, curing cancer, eliminating war and turning Earth into paradise. They seem to think that they are helping out the Human Race to re-start a new, happy, crime free, loving planet. It was easy for these “aliens” to instert themselves into unsuspecting victims. After they inserted themselves they would be in control of the body, memories and all. But some people want Earth back, especially Melanie Stryder, who refuses to surrender, even after being captured in Chicago and becoming a host for a “soul” ( this is what they call themselves) called Wanderer. Usually when a “soul” takes over a body, the person that was inside just dissapered…then there were those that didn’t. Melanie stayed. She uses her surviving brain cells to persuade Wanderer to help search for her loved ones in the Arizona desert. These “Souls” think that humans are terrible and disgusting. Most of them anyway…except for the Wanderer. When the pair find Melanie’s brother and her boyfriend in a hidden rebel cell led by her uncle, Wanderer is at first hated, becuase of course, these beings took over they world and stole their loved ones. Once the rebels accept Wanderer, whom they dub Wanda, Wanda’s whole perspective on humanity changes. What follows is a tale of survival, friendship, and love, by telling about Earth’s invasion from the conqueror’s viewpoint. It overcomes a slow beginning after Wanderer reaches the humans and begins to care about the ones she meets personally. She comes to love Melanie’s brother like her own, fights her body’s attraction to Melanie’s boyfriend, and grows even closer to another human, Ian. The humans in turn accept Wanderer as a valuable and caring individual, rather than as Melanie’s oppressor. They overcome their prejudices and begin to work together in the humans’ best interests. In a story full of hate, love and most deffinatly hope. There is an awesome story told of how not everyone is the same and good things can come from this. When people over come normality and open their minds to a new begining, great things are achived from one soul to another.